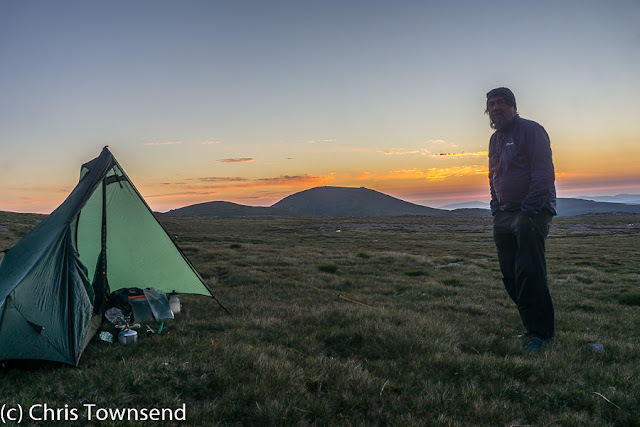 During the longest spell without rain during this heatwave - ten days - I had an overnight trip on the Cairngorm Plateau, which I wrote about here. Afterwards I posted a picture of all my gear laid out at my camp, noting that being able to do this was extremely rare. People then asked me questions about items of gear – what it was, what it weighed, how it performed, and more. I promised to describe all the gear and my reasons for selecting it in a blog post. Here it is. Firstly, I should say that because I test gear for The Great Outdoors I always have a wide selection to choose from. For this trip I took some items I was testing for forthcoming reviews, some items to see how they’d perform in the hot dry conditions, and some items because they seemed ideal for this trip. 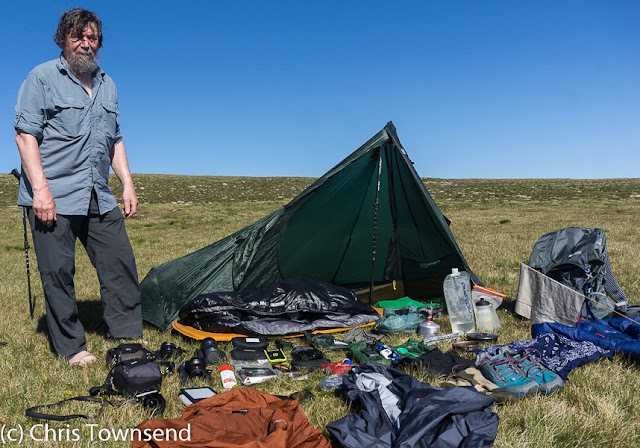 That said, any selection of gear for a summer trip, whatever the weather, wouldn’t vary much from this except in two cases (tent and waterproofs). For a longer trip the main change I’d make would be to drop some of the camera lenses to keep the weight down. The weight of my pack with food was 5.5kg without the camera gear. With lenses and tripod it was 7kg. Pack: Gossamer Gear Mariposa 60. This is a pack I’m currently testing. 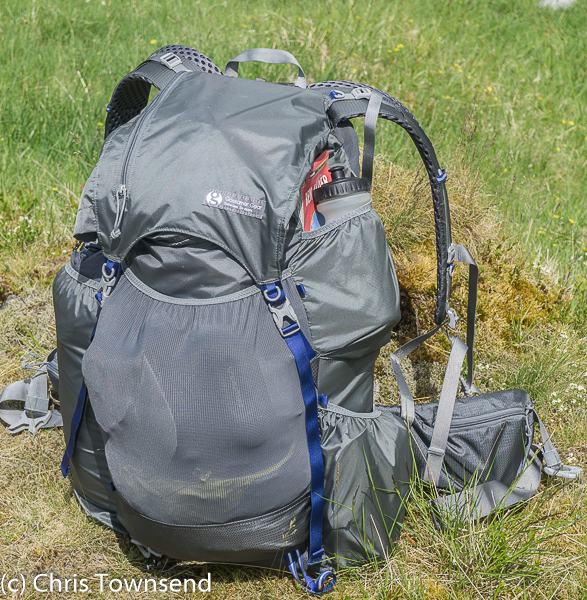 It’s ultralight at 927 grams, roomy at 60 litres, and has plenty of pockets. It easily handles 15kg of gear and was nowhere near full. I found it stable and comfortable. It’s quite close-fitting and I did get a sweaty back. I think that would have been the case with any pack however due to the hot dry conditions. Also, I prefer body-hugging packs anyway as they are more stable on rough terrain. I’ve used Pacerpoles on walks long and short for many years now and I can’t imagine being without them. The 590 gram Dual-Lock with the external length adjustment is the best version yet. 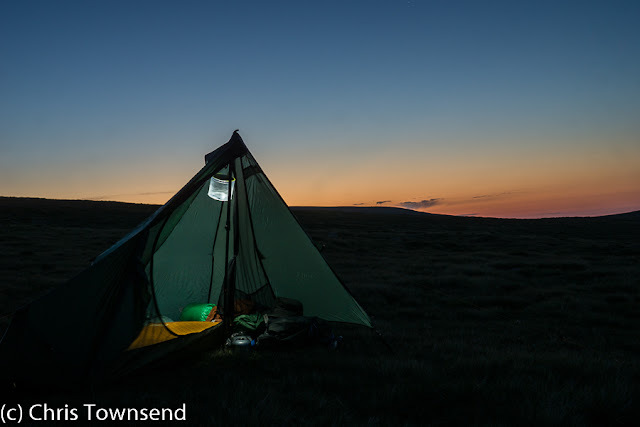 Tent: Big Sky Wisp 1. I took this ultralight single-skin tent to see how it performed in the low humidity. On previous occasions when humidity was high, as is usual in the Scottish Highlands, condensation had been awful, with moisture streaming down the walls. Big Sky do say it’s not recommended for high humidity areas. On this occasion there was no condensation at all, not a drop. The air was just too dry. 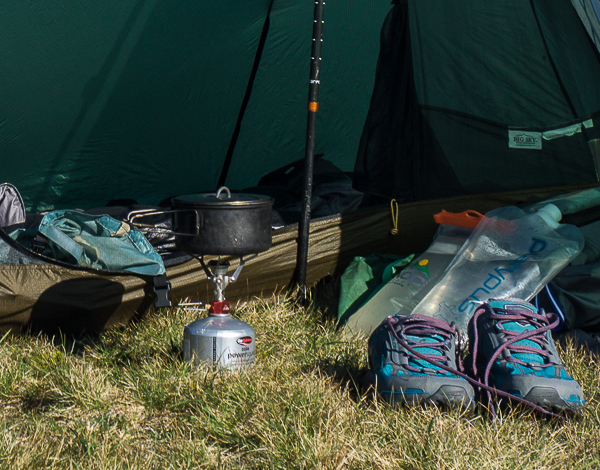 At 640 grams the Wisp 1 is very light for the space provided – there is room to store gear, cook under cover, and sit up. 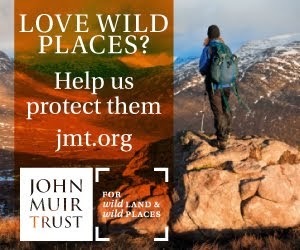 I like the design but wouldn’t choose to use it for most Scottish trips. For a desert walk it would be great. Sleeping Bag: Sea to Summit Micro MCII. 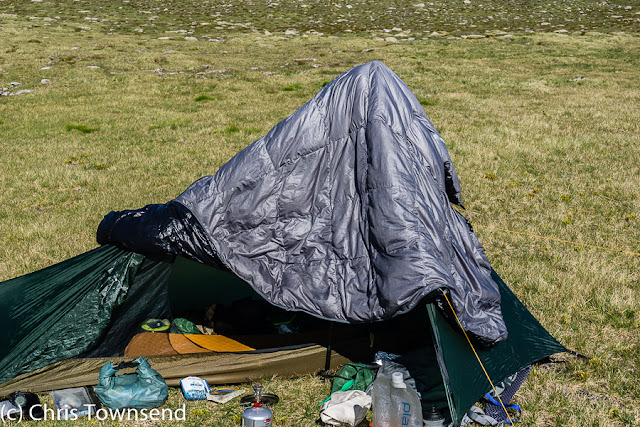 I wasn’t expecting a cold night and this ultralight down sleeping bag – just 610 grams – with a comfort rating of 7°C and a comfort limit of 2°C was fine. It has a full-length zip and a drawcord-closed foot, so it can be easily vented – I was more concerned about being too hot than too cold. As it was, the overnight low was 10°C and whilst I had the zip almost fully done up when it was that temperature I didn’t do up the hood and by early morning the zip was undone as was the foot. Mine is the first version of this bag and has a simple flat hood. The current one has a shaped hood and the down fill is now water-resistant. Sleeping Mat: Therm-A-Rest ProLite 3 Small. I’ve had this self-inflating foam mat for many years. It’s light at 350 grams, warm enough in above freezing temperatures, comfortable, and quite compact when deflated. This stove was being tested for a forthcoming review. It’s ultralight at 75 grams, very powerful and simmers easily. I took two almost empty 250-gram cartridges and only used one of them. The stove worked fine but given the temperatures and the still air – I had a foil windshield but didn’t use it – this was hardly a severe test. Pots, pans, utensils: Evernew 900ml titanium pot. MSR 700ml titanium pot. MSR titanium spoon. Outdoors Grub polycarbonate spoon. Light My Fire Firesteel. Lighter. Microfibre cloth. This is my standard kit and has been on many long-distance walks. The pots are over 25 years old. Total weight: 550 grams. It all lives in a small nylon stuffsack along with the stove. Water containers: Cnoc Outdoors Vecto. Platypus 2 Litre. GoLite 700ml. I don’t usually decide exactly where I’ll camp in advance, so I like to have enough containers that I can carry water to a dry camp. Flexible collapsible containers are ideal for this. I also like to have one rigid bottle for use during the day and because it’s easier to fill from a trickle or still water than a collapsible one. The three together weighed 194 grams. On this occasion I camped near running water and never carried more than 700ml as there were plenty of sources each day. Trail Shoes: Altra Lone Peak 4.0. This was the first outing for these trail shoes. Having found the previous two versions of the Lone Peak excellent I was pretty certain these would be fine, and they were. Comfortable, good grip, good cushioning. My pair of size 9.5 weighs 678 grams. Waterproofs: Berghaus Hyper 100 Jacket. Marmot Essence Pants. With no forecast of rain I could have gone without waterproof clothing. However, I think I’d have felt underequipped even in a heatwave! And sudden changes in the weather are not unknown in the Highlands. So I went with the lightest waterproofs I have. Berghaus’s Hyper 100 Jacket weighs 106 grams and is extremely breathable. Marmot’s Essence Pants weigh 185 grams and are quite breathable. I doubt either would stand up to regular use but for trips like this they’re ideal. I thought I might need a windproof more than a waterproof. In fact I didn’t and never wore it. Still, the Houdini only weighs 105 grams and so didn’t add much to the load. This is the original Berghaus ultralight insulated HyperTherm jacket. It weighs just 163 grams but is as warm as a midweight fleece and also wind-resistant. For trips where I expect to wear it often I prefer the heavier (224 grams) Hoody version which has a hood and pockets but for a trip like this where I don’t expect to wear it the minimalist design is fine. I did wear it in fact – when outside watching the dawn at 3.30 a.m.
Trousers & Shirt: Mammut Runbold Trousers. Rohan Expedition II Shirt. Why didn’t I wear shorts? I forgot them! I hate driving in shorts as my bare legs stick to the car seat so I’d intended changing in the car park. That’s when I found I’d left them at home. So the Runbold trousers had an unintended test in the heat, which they passed easily, being comfortable, breathable and never too hot or too sticky. I’d originally chosen them because at 310 grams they’re the lightest trousers I have and I thought they’d spend all their time in the pack. In warm weather I like loose fitting synthetic shirts with roll up sleeves and big pockets for phone, compass and other items. The 243-gram Rohan Expedition Shirt is one of the best I’ve tried. The fabric wicks moisture quickly and dries fast. 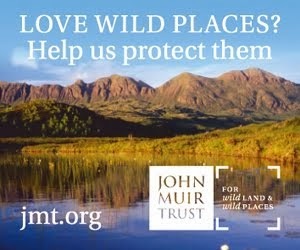 It has an insect repellent treatment too, useful against midges. though there were none on this trip. The pockets are roomy and I like the Velcro-closed flaps as they’re easy to use. (Disappointingly I see the current version has buttoned flaps). The shirt was fine in the heat. I’ve worn Tilley Hats on long and short walks since I discovered the original version in Whitehorse in the Yukon Territory 28 years ago. These cotton hats are tough, comfortable, breathable and generally excellent. This year I’ve been trying the 105-gram t5 Organic version and liking it very much. Socks & Briefs: Dahlgren Ultra Light socks. Adidas Climacool Boxer Briefs. Both socks and briefs were lightweight and fast wicking and worked fine in the heat. Lighting: Luci Pro Outdoor 2.0 Inflatable Light. Petzl Actik headlamp. With only a few hours of semi-darkness at this time of year a torch of headlamp isn’t really required. However I never go without one just in case I might need it during those darker hours. On this trip I took two because I wanted to take pictures of the tent during the night. The inflatable light, one of my favourite pieces of new gear, was to light the tent. It weighs 173 grams. The headlamp was to light my tripod and camera. It weighs 93 grams. Smartphone & Charger: Samsung Galaxy 7. GoalZero Venture 30. 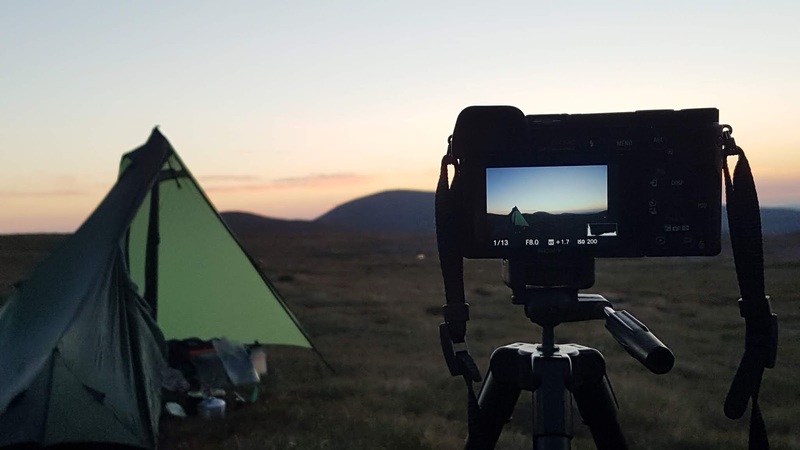 I used my phone as a camera, GPS, and for posting pictures to social media when I had a signal – which wasn’t much of the time. I charged it once during the trip. The phone is over two years old now and battery life has shortened. 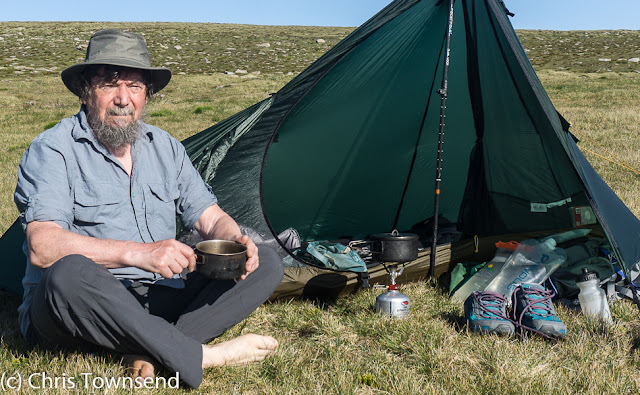 Other items were compass, map, emergency whistle, dark glasses, sunscreen, midge repellent, head net, mosquito coils, Kestrel weather meter, SPOT, notebook & pens, reading glasses, repair kit, first aid kit, wash/toilet kit, Kindle. As I had a light load and this was just an overnight trip I took more camera gear than usual. Normally I carry two lenses, not five. I wanted the fast lenses – the 50mm f1.8 and the 12mm f2 – for low light photography. The total weight with cases – ThinkTank Mirrorless Mover 10 & 20 for the cameras with zoom lens, Zing! Neoprene for the lenses – was 3.13kg. 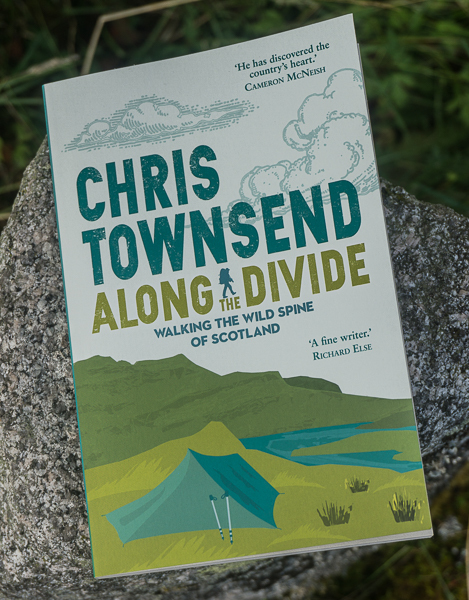 Great article Chris - would love to know what you keep in your first aid and repair kits? I'll write a post on that soon. Thanks.